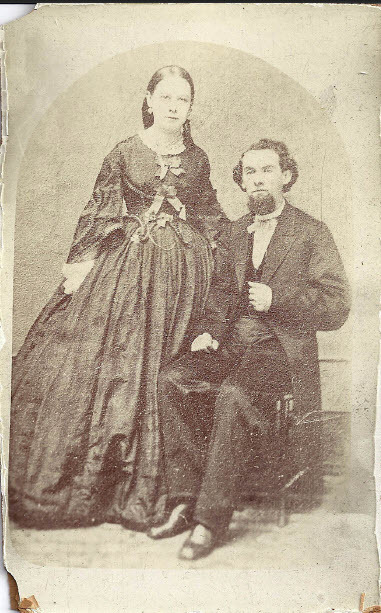 Thanks to the generosity of a St. Louis cousin, we now have a photograph of John Sebastian TRARES and his wife, Cordelia. That’s the best thing about the genealogy community – you meet wonderful people who are always willing to share information, including treasured photographs. And, yes, in case you’re wondering, I did ask Jeff’s permission to share this great photo with you before posting this. A sincere thank you to Jeff for his generosity! And on behalf of the Knapp clan, we extend an open invitation to Jeff and his family to attend our next annual Knapp Reunion scheduled for sometime in July 2012. There will be a Save the Date notice sent out soon – for those of you who can’t wait to start planning next year’s event! Jeff is a policeman in the St. Louis area and is interested in joining forces to learn more about the TRARES side of the family. We hope to exchange information very soon. Jeff is a great-great-great-grandson of John Sebastian TRARES. And just to refresh your memories about John Sebastian TRARES…. He was the son of Matthias TRARES and Elizabeth HELMLING. He was born in Hesse Darmstadt, Germany on 27 Dec 1835. He was the brother of Agnes TRARES, who married John KNAPP, the son of our immigrant ancestor, Franz Adam KNAPP. While researching the TRARES side of the family, I got curious about what had happened to John Sebastian. All of his brothers and sisters stayed in the Portage county area. I couldn’t figure out what had happened to John Sebastian until I Googled his name and found an old photo of his home in Edwardsville, Illinois. I wrote a 3-part series of posts about him, detailing his amazing career as a self-made man who went west to seek his fortune. He became a very successful pharmacist and businessman in Edwardsville, Illinois – and built an impressive Empire-style home in Edwardsville. The family home is now a funeral home in Edwardsville. The woman pictured with John Sebastian (Jeff believes) is his second wife, Cordelia. John’s first wife, Josephine, died in 1884, and he remarried Frances Cordelia Winchester on 17 Feb 1887. This photo was likely taken sometime after 1887. Cordelia was born 21 May 1851 in Louisiana and was the daughter of Edward C. Winchester and Ann C. Dorsey. She died 19 Dec 1927 in St. Louis, Missouri. I expect to learn more from Jeff and his family about the TRARES connection as we compare notes. So stay tuned for more on the TRARES family in future posts! This entry was posted in Family History, Germany, Hessen, Knapp, Photos, Portage County, Trares and tagged Franz Adam Knapp, Helmling, John Sebastian Trares. Bookmark the permalink. 1 Response to John Sebastian Trares: Photo from a St. Louis area cousin! I am descended from John Kline (1820-1855) and his wife Margaret May. I want to thank you for all the research involved in publishing Knapp Notes. Although my line left Portage County in the 1870s I greatly enjoy reading the notes and have learned a lot about the relatives and associates of the Kline family. I hope to visit Portage County in the future. Although I am not descended from the Trares I would like to comment on the photo just posted. I don’t think the photo could have been taken in the 1880s. The clothing styles are those of the mid 1860s. The lady’s dress has a very full skirt over a hoop. Her bell sleeves open to show white undersleeves. The bodice appears to have what were called “jockey points” at the waistfront. If the lady could not afford the latest style, she would have taken the old dress apart and remade it in a more stylish shape. However this woman appears too young to have a 20-year-old dress. The man’s clothing is also typical 1860s. He wears a long coat over a vest and a bow tie. His boots are square-toed. He has a stylish 1860s beard. Men’s styles did not change as quickly nor as dramaticaly as womens and 1880s men’s clothing is not much changed. The pose is typical for a weddng photo. The original is probably about 2.5 inches wide and 4 inches tall on a yellowish or tan cardboard. It should have the photographer’s name and place of business on the back (which will help you date and place the photo and determine who the people could be). It may also have a Civil War revenue stamp on the back.